September is a great month to start fresh on your health and fitness goals. With summer vacations behind us and kids back to school, why not make the most of the next two months before the holidays set in. 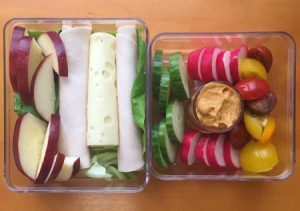 Take advantage of the variety of fresh produce available this season and make perfectly balanced lunches for your kids (or yourself) all week long. I never truly appreciated why the start of the school year was so exciting for parents until I had a school-aged child. As much as I love summer for all it has to offer from the weather and weekends away, to the barbecues and occasional ice cream treats, there is something to be said for getting back into a routine. 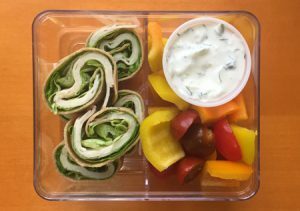 While the thought of making lunches again can seem daunting, especially when it comes to kids, here we have some Zone-Friendly kid-inspired lunch ideas that can be prepared in a snap! Replace your bread with lettuce to add crunch to this lunch-inspired meal with turkey, cheese, cucumbers, radishes, heirloom tomatoes and roasted red pepper hummus for dipping. And don't forget the apple for dessert. 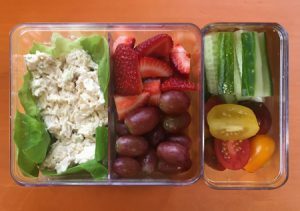 Save time by buying prepared chicken salad (or use tuna, if you prefer) and add tomatoes, cucumber sticks, grapes and strawberries. Strawberries and blueberries add the right amount sweetness to Greek yogurt. Couple with veggies and guacamole for the perfect Zone meal. Enjoy deli turkey, lettuce and cheese on a low-carb wrap (i.e. Joseph’s Oat and Flax) with cut up veggies and Tzatziki for dipping. 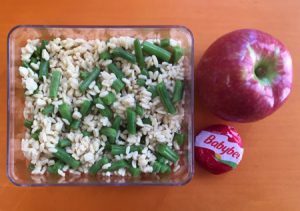 Zone Orzo in olive oil with green beans, and a whole apple and cheese is the right balance of protein, carbohydrates and fat to keep you satisfied. We know shopping often takes place on the weekend, so we’ve repeated some of the veggies and fruits and even some of the protein choices. 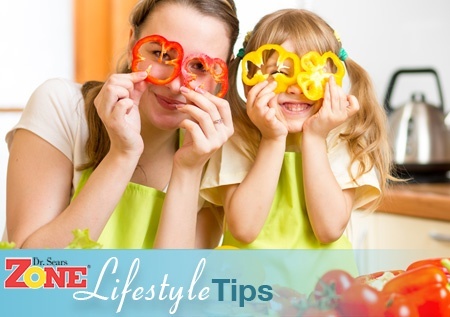 By changing up how items are used, cutting fruits and veggies into different shapes or using lettuce or a wrap in place of bread, it makes each day seem fresh and different. Cutting up produce on the weekend and storing in zip-lock bags can save time in the morning. Leftovers make for great lunches. Although we minimize the amount of grains on the Zone eating plan, low-carb wraps or sandwiches using only one-slice of bread vs. two when coupled with protein and fat are ok choices on occasion. While prepared chicken and tuna salad can be high in fat, they can definitely help in a pinch when trying to save time. For kids on the Zone, we use 2 Zone Food Blocks for meals whereas adults are 3 blocks. While these recipes are inspired by school lunches, they are just as good for adults to bring to work, whether you are in an office or out in the field. 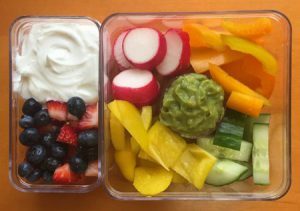 Things don’t always go according to plan, even when you have the best intentions for a healthy lunch for your kids. When my daughter started Kindergarten last year, for the first two weeks of the school year she came home with a full lunch box almost every day. Here I was thinking she was gabbing at the lunch table instead of eating, only to receive the bill two weeks later that she had actually been buying lunch instead of eating the ones I made! Don't get discouraged! Keep on exposing your kids to healthy options and soon they’ll begin to prefer them. Sometimes you just have to be persistent. With two months to go before the hustle and bustle of the holiday season begins, use this time to focus on you and your families' health, because what better time to start than now!